A tender, moving story of a child waiting at home for the return of his father from serving in WWI. During World War I, Australian and New Zealand soldiers on the front were sent Christmas care packages in a tin billy. 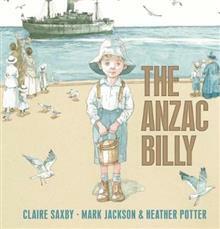 The Anzac Billy is the heartwarming story of a little boy pac... read full description below. A tender, moving story of a child waiting at home for the return of his father from serving in WWI. During World War I, Australian soldiers on the front were sent Christmas care packages in a tin billy. 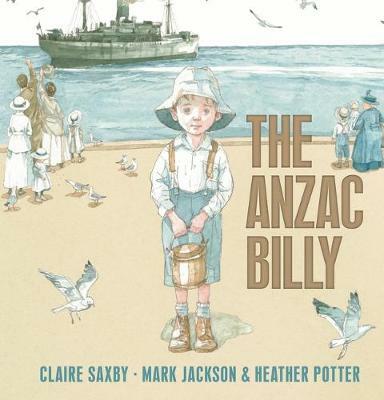 The Anzac Billy is the story of a little boy packing a billy with all his father's favourite things - added to by mum and grandma - even though he realises there is no way that the billy can actually go to a particular soldier. Perfectly researched, exquisitely rendered, no reader could fail to be moved by this Australian story. Claire Saxby was born in Melbourne and grew up in Newcastle. She's lived in more houses than she can remember, and attended many schools. Claire is the author of many books including There Was an Old Sailor, illustrated by Cassandra Allen, which won the Crystal Kite Member Choice Award, Australia and New Zealand Division, Society of Children's Book Writers and Illustrators, 2011. Mark Jackson is an illustrator based in Melbourne. He has co-illustrated several books with his wife, Heather Potter, and their work has been featured in several exhibitions. Mark has several titles published by Walker Books Australia: The Truth About Penguins written by Meg McKinlay, 2010; Not Like Georgie written by Scott Hatcher, 2009; and Stuck! written by Charlotte Calder, 2009, which was short-listed in the Young Children Category of the Speech Pathology Australia Book of the Year Awards 2010, and received a Notable mention in the Picture Book Category, Children's Book Council of Australia Awards, 2010. Platypus, published in 2015 and a part of the award-winning Nature Storybook series, was a Notable Book at the CBCA Book of the Year Awards in 2016 and was also short-listed for the Wilderness Society Environment Award for Children's Literature in the same year. For more information and samples of his artwork, please visit his website: http://www.jackpot-art.com/ Heather Potter is an illustrator based in Melbourne. She has co-illustrated several books with her husband, Mark Jackson, and their work has been featured in several exhibitions. Their first Walker Book together was picture book Not Like Georgie by Scott Hatcher, 2008. Heather also illustrated the verse novel Pearl Verses the World in 2009 by Sally Murphy, which won the Children's Book Category for the Indie Book of the Year Awards and Honour Book, Younger Readers category, Children's Book Council of Australia Book of the Year Awards, 2010.